What?! Three days in a row, turkeys. That's gotta be a record when yer podcasting nothing but WILD SOUNDS & ROCK 'N' ROLL!! 50's Punk and Rockabilly Week continues here on RadiOblivion. Another 20 minute podcast that'll make ya look fer an excuse to commute somewhere. In this eppy-sode ya get Buzz Busby sufferin' from Rock 'N' Roll Fever, Psycho Lee Lewis just-a Lovin' Up A Storm, Vince Taylor provin' that a Briton or two knew about 50's Punk Rock whilst showing off his Brand New Cadillac (aff), Jack Earls with the command Let's Bop (aff), Carl Perkins sez Her Love Rubbed Off, and Junior Thompson and the Meteors get a Raw Deal. 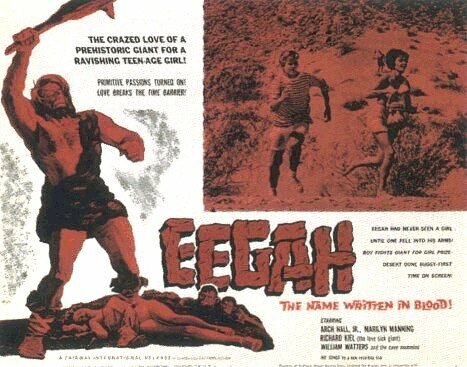 We even hear as Eegah Crashes The Party (aff).